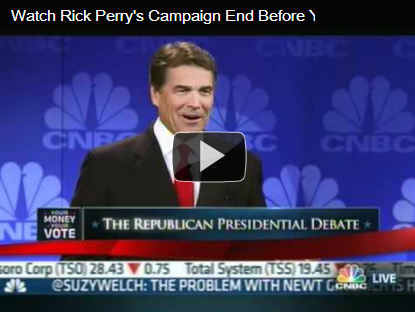 Rick Perry, the Governor of Texas stumbled bad during a debate. He looked at one debater in the eyes and sternly told him he would eliminate three agencies he had promised to get rid of if elected president. Perry could only get out 2 of the three as the another debater chimed in “EPA” jokingly. Perry was asked again by one of the commentators and he completely choked and just ended it with a big “OOPS”. Very embarrassing. After watching it I kind of feel bad for him because I’ve experienced that frozen feeling you get when you’re public speaking. When you know the answer to something and just can’t recall it, then when someone distracts you it makes it even worse to recall it! It appears they’re trying to cover up the mistake, although I can’t’ see any way of digging yourself out of this one! I searched “Rick Perry” in Google and saw a sponsored ad that said “We’ve all had human moments”. Below the title it said, choose which agency you would eliminate. The link went to he Rick Perry Website where you could vote on your choice. Good effort but I don’t think this will fix the Rick Perry Oops Video planted all over YouTube. Now: View the Saturday Night Live (SNL) Rick Perry Skit.